We still can’t believe how long fall is lasting this year. 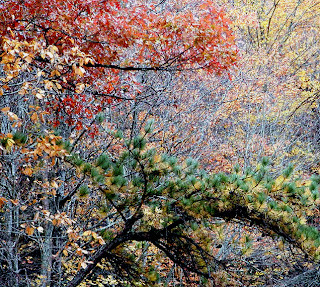 We’re almost midway through November, but you wouldn’t know it by looking at the trees. This final fall foliage report should’ve happened earlier, but we’re glad we’re still reporting on all the color. 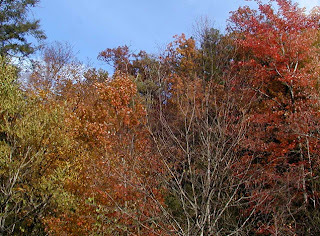 It seems for every tree that sheds all its leaves, another one bursts forth in a blaze of red, gold or orange. A few things we’ve enjoyed this week — the wind is starting to blow the leaves around (and off the trees) and the sight of leaves blowing on the road while we’re driving brings a smile to our faces. Having nature dancing around the car is just plain smile-worthy. Next, we enjoy listening to the sound of the leaves falling in the forest. 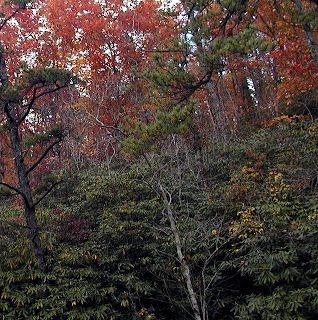 We’re surrounded by the Pisgah National Forest, so there are thousands upon thousands of trees around us. The constant patter of leaves falling from the trees makes a pleasant sound that doesn’t disturb the peacefulness at all. It actually adds to it. Finally, we like seeing the tall trunks of the trees that border the orchard capped by splashes of bronze and rust. What a pretty sight. Take in some of the many hiking trails in the little town of Montreat, just north of Black Mountain (about 15 minutes from the Inn). Check out the National Gingerbread House Competition Display at the Grove Park Inn. The houses will be on display to the public, Monday-Thursday, from November 14, 2007, through January 6, 2008. Head to Asheville on November 17 for the 61st Annual Holiday Parade. You’ll catch vibrant fall colors and a fun parade. Be aware that there will be street closings in anticipation of a crowd of 10,000 spectators. Looking to get away from the crowds? Take US-70 to US-221 and head up to the Linville Gorge area for the day. 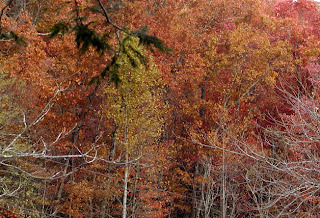 Leaf hunters report beautiful color on US-221, making the journey a memorable one. 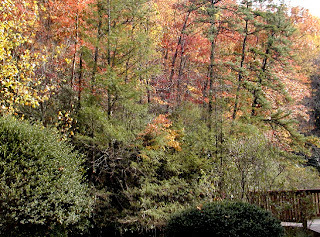 Plus, Linville Gorge, Linville Falls (MP 317 on the Blue Ridge Parkway) and the Linville Caverns make the destination equally scenic. This entry was posted in Uncategorized and tagged Asheville, Autumn / fall foliage, Blue Ridge Parkway, hiking by Inn on Mill Creek. Bookmark the permalink.